Supreme Court President Asher D. Grunis is no more likely to block the recently announced release of 104 Palestinian prisoners with blood on their hands than was his predecessor Dorit Beinisch, said Meir Indor, the Almagor Terror Victims Association head, on Monday. From Indor’s perspective, even if many view Grunis as less left-wing on certain issues, Grunis still “looks at the issue from the perspective of the politicians,” he said. He explained that Grunis would likely view the release primarily as “an issue of state policy,” and not primarily about contempt for the court’s prison sentences and the injustice toward the prisoners’ victims. Indor hopes to block the prisoner release with a public relations campaign, along with a recent letter that Almagor sent to State Comptroller Joseph Shapira. He said that terror victims and their supporters would campaign “day in, day out” to fight the deal in the hopes of not being forced to file a petition with the High Court of Justice, which in any event cannot be filed before an actual release date is announced and about to be implemented. Indor said that it is important that the public view the release not from the perspective of being a political choice, but from the perspective that, as he views it, such releases “undermine the entire standard legal framework” for bringing terrorists to justice, keeping them behind bars and providing justice to victims. Indor noted the absurdity of a situation whereby prisoners who had only committed non-violent crimes would never be released as a diplomatic gesture, but prisoners “whose crimes were violent enough” could be, since those crimes were politically motivated. Kerry had opposed similar deals in other contexts, but not here, he said. Regarding Livni, he said that she could not be both the top law enforcement officer who sends people to jail, and at the same time the lead negotiator for peace talks, releasing terrorists from jail. Protesters gathered Sunday to show their ire near the Knesset as ministers voted to free terrorist murderers for “peace” talks with the PA.
More than a hundred activists gathered Sunday to show their ire across from government offices near the Knesset as ministers voted to release terrorist prisoners with blood on their hands in order to talk “peace” with the Palestinian Authority. The protests are continuing, with a new rally scheduled to begin Monday evening led by the founders of the Koby Mandell Foundation—the parents of Koby Mandell, one of two teenagers murdered by terrorists in cold blood on the outskirts of the Jewish Judean community of Tekoa where he lived in eastern Gush Etzion. Meir Indor, chairman of the Almagor Terror Victims Organization, expressed the outrage of families who lost loved ones to terror attacks and who now face the prospect of watching their killers walk free. “We want to see the prime minister keep his word, to keep what he promised to us, what he promised to me at a personal meeting, that he’s not going to release terrorists,” Indor told Arutz Sheva. “If he cannot stand up to Kerry’s pressure, there are other people who will do the job,” he said. Daube observed, “The American government—I know—has been putting a tremendous amount of pressure on the Israeli government to release these prisoners as a precondition to negotiations. [But] if these were negotiations with a true peace partner we would not have to release murderers, I’m sorry. “I do believe that this is not a political issue. The reason why we are here is because this is a moral issue. This is also a security issue. With the rate of recidivism at what it is for released terrorists, you can be assured that this is a matter of pikuach nefesh—of endangerment of Jewish life—therefore these prisoners should not be released. “Suicide is not part of my daily routine,” Daube said simply. Almagor Terror Victims Association, Israelis outraged at decision. Hundreds of outraged protesters gathered outside Prime Minister Binyamin Netanyahu’s office in Jerusalem Sunday morning to express their anguish over his decision to release 104 Palestinian prisoners as a concession for restarting peace negotiations. The demonstration – arranged by the Almagor Terror Victims Association and families who have lost loved ones to terrorism – featured black-and-white placards with images of victims killed by the prisoners being released. Posters with red handprints – illustrating the blood on the prisoners’ hands – were also prominently displayed by a number of protesters, who ranged from teenagers to octogenarians. “This is not a political issue for me; it’s a moral one,” said Jeff Daube, director of the Israel office of the Zionist Organization of America, who attended the demonstration. “With the rate of recidivism being what it is, we are virtually assured that this will cost Jewish lives. If these terrorists don’t return to terrorism itself, they will return to aiding and abetting terrorists,” he continued. “Suicide is not part of my daily routine,” Daube stated. “It appears that Bibi never heard this,” Gefen added. “In my opinion, the [most difficult] part of Middle East negotiations is [maintaining] self-respect, and today Netanyahu and the government have given it up,” said Tikochiski. “This is the beginning of negotiations, and Netanyahu is starting from a point of weakness,” he continued. Nadav Meron, a 23-year-old Likud member, also condemned Netanyahu’s decision. “I’m here because I think letting terrorists go free is something we should not do. It’s giving a present to terrorists,” he said, adding that he dreads the inevitable celebrations and hero’s welcome the released terrorists will likely receive upon returning home. “When they get back home, [the Palestinians] will have parties to celebrate them,” Meron said. “How can this be a ‘peace process’ if they celebrate terrorists when they come back home?” Lizi Haneiri could barely contain her tears as she decried what she described as American pressure and hypocrisy doled out by US Secretary of State John Kerry. “We’re here to tell our prime minister that we voted for you, not Kerry,” said Haneiri. “And who gave Kerry the right to tell us to release murderers? Would the US release terrorists from Guantanamno [Bay]? Which other country in the world would do such a thing? “These terrorists have blood on their hands – the blood of children, women, of innocents!” she continued. “We trusted the prime minister to protect us and now he’s releasing murderers. Who’s going to protect us?” Meanwhile, the sister of a soldier who was abducted and murdered by terrorists in Netanya in 1984, held up a black-and-white placard baring her brother’s face. After a bitter debate lasting several hours, Israeli ministers voted Sunday to gradually release 104 long-term Palestinian prisoners in order to facilitate this week’s resumption of negotiations with the Palestinians. Thirteen ministers voted for the measure, seven against and two abstained. The vote approved the establishment of a committee to manage the phased process of prisoner releases, and approved the resumption of the talks, which are set to restart after a hiatus of almost three years in Washington on Tuesday. The issue of releasing the prisoners, jailed since before the Oslo Accords were signed in 1993, has divided Israelis, many of whom see the freeing of convicted murderers and terrorists as a price too high to pay for a return to the talks. Others regard it as a necessary evil, meeting a Palestinian demand to enable a resumption of negotiations. Prime Minister Benjamin Netanyahu said that approving the releases was a deeply painful decision, but one that served the wider interests of the state. Underlining the anguish and divisions over the move, two ministers from Netanyahu’s own Likud party voted against it, and two more abstained. The list approved by the Cabinet did not include any Israeli-Arab pre-Oslo convicts. Palestinian officials quoted on Israel’s Channel 10 news said Sunday night that this was a problem, since they said Netanyahu had pledged to release more than a dozen Israeli-Arabs. The committee that will handle the process of four phased releases as the talks continue will be made up of Netanyahu, Defense Minister Moshe Ya’alon, Justice Minister Tzipi Livni, Science Minister Yaakov Peri and Public Security Minister Yitzhak Aharonovitch. It will decide which prisoners on the list of 104 will go free at what stage, determine whether they will be allowed to return to their homes or be sent into exile, and oversee the implementation. Peri, a former Shin Bet head who belongs to the centrist Yesh Atid party, was a last-minute addition meant to ensure Netanyahu a majority in the small panel in the event that Ya’alon and Aharonovitch decided to torpedo aspects of the deal. Peri confirmed after the vote that the list of 104 names did not include any Israeli Arab citizens, more than a dozen of whom have been held since for pre-Oslo terrorist crimes. If their releases were sought, he said, that would require further debate. Ya’alon had objected particularly strenuously to freeing Israeli Arabs since, he said, the Palestinian leadership did not represent them. Voting in favor of the 104 releases were Netanyahu, Ya’alon, Gideon Sa’ar, and Yuval Steinitz (all Likud); Aharonovitch and Sofa Landver (Yisrael Beytenu); Yair Lapid, Yael German, Peri, and Shai Piron (Yesh Atid); and Livni, and Amir Peretz (Hatnua). Yisrael Katz and Gilad Erdan (Likud), Naftali Bennett, Uri Ariel and Uri Orbach (Jewish Home), and Uzi Landau and Yair Shamir (Yisrael Beytenu) voted against the measure. The Likud’s Limor Livnat and Silvan Shalom abstained. “This moment is not easy for me, and it isn’t easy for the government ministers, and is certainly not easy for the bereaved families, whom I deeply understand,” Netanyahu said. He also said that he didn’t lectures about standing up to terrorism, noting that his brother Yoni was killed leading the 1976 Entebbe rescue operation, extricating hostages from the hands of terrorists. In opposition, Netanyahu opposed the release of terrorists as a move to facilitate peace talks, but two years ago as prime minister he approved the release of more than 1,000 Palestinian security prisoners to secure the freedom from Hamas captivity in Gaza of kidnapped Israeli soldier Gilad Shalit. “The decision represents a new record in the theater of the absurd in which Israel abandons its security while gaining nothing in return. It has once again been proven that the peace talks are only a means by which the Palestinians extract Israeli concessions, and unfortunately, the government once again fell into this transparent trap,” Levin said immediately after the vote. Before the meeting, Education Minister Piron and Home Front Defense Minister Erdan unexpectedly announced that they planned to vote against the motion, though Piron ultimately changed his mind. The announcement was a temporary blow to Netanyahu, who had promised Secretary of State John Kerry that the move would go through. Netanyahu postponed the commencement of the meeting in order to take time to convince his Likud party ministers to back up his proposal. Netanyahu invited Shin Bet head Yoram Cohen to brief the ministers on the security ramifications of approving the release, and said that decisions regarding the release of Arab-Israeli prisoners — a particularly contentious aspect of the move — would be brought before the Cabinet separately, and that any Palestinian “provocation” would lead to the halt of the phased releases. Cohen told ministers that the release of terror convicts undermined Israel’s deterrent capability, and that with time many would return to terrorist activity. However, he added, a return to negotiations would calm the Palestinian street. Crucially, Ya’alon said early Sunday that he would back the move “with a heavy heart,” though he would oppose freeing pre-Oslo Israeli Arab convicts. Ya’alon has opposed prisoner releases in the past, and his security credentials — he is a former chief of staff of the IDF — may have eased the worries of some ministers who were hesitant to vote with Netanyahu. The cabinet earlier approved a bill mandating a referendum for any accord involving Israel relinquishing sovereign territory. The prisoners, some of whom were convicted of major terrorist attacks involving multiple murders, will be released in stages and some may be sent into exile. The phased approach is meant to ensure the Palestinian side does not walk away from the table once talks begin. Chief Palestinian negotiator Saeb Erekat welcomed the vote. “I believe this is a step toward peace and I hope that we can use this opportunity that the US has provided for us to resume negotiations,” Erekat said. The Palestinian Authority had long sought the prisoners’ release as a precondition for resuming talks, a demand Israel refused. Netanyahu previously offered to free several dozen of the pre-Oslo prisoners, but had balked at releasing them all. PA President Mahmoud Abbas, speaking to Arabic media Saturday in an apparent reference to the freeing of the prisoners, had said he was expecting “good news” on Sunday. In Ramallah, though, hundreds of Palestinians marched Sunday against a return to talks, clashing with security forces, Palestinian media reported. 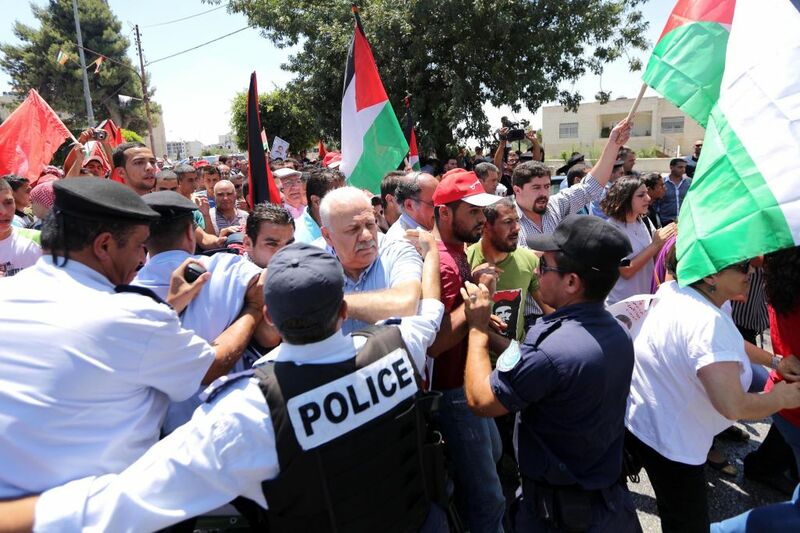 Four Palestinian Authority police officers and three protesters, including a member of the PA legislative council, were injured in the fighting, according to the Maan Palestinian news agency. Kerry announced in Amman on July 19 that a basis for the resumption of negotiations had been worked out and that Israeli and Palestinian negotiators could be expected in Washington within a week or so. However, in the following days Palestinian officials claimed that the framework for the negotiations was not fully resolved — and restated their demands for the release of the pre-Oslo Palestinian prisoners and for the use of the pre-1967 lines as the basis for negotiations on a Palestinian state. While waiting for Sunday’s Cabinet meeting to begin, Jewish Home leader Bennett spoke to families of terror victims who were staging a demonstration against the decision outside the Prime Minister’s Office. “Releasing murderers brings a lot of bereavement and it is a mark of disgrace against Israel. Anyone on the other side [the Palestinians] who today calls for the release of murderers and burners of children and women, does not deserve to be called a partner,” said Bennett. Bennett told the families to keep their heads held high. “Terrorists need to be wiped out, not released. We will vote against releasing murderers,” he promised. After the vote he said it was a “tough day” for the government. Lapid said ahead of the meeting that, while he was saddened by the decision to release murderers, it was necessary in order to give peace a chance. “This is not a happy day for the state of Israel. These people should rot in prison all of their lives, but we need to do what is possible in order to start the peace process,” said Lapid. Shortly after his announcement, families of Israeli terror victims came out strongly against Netanyahu. The families alleged that Israel was being “pressed again into failed negotiation” because of the personal ambitions of US President Barack Obama and his secretary of state, John Kerry. They said that Netanyahu had issued “repeated assurances” that Israel would not be releasing terrorists and had rebuffed with “various evasions” their requests that he meet with them. If the situation in Israel were a game of monopoly, Israel would be about to trade 104 get-out-of-jail-free cards for a chance to discuss free passage over Pacific Avenue with the Palestinians. The headlines adorning the four Israeli papers provide a window into how each one plays the news against its predetermined agenda. Yisrael Hayom, widely believed to be a mouthpiece for Prime Minister Benjamin Netanyahu, gives the same headline Bibi would: “The talks, and the price” (along with a quote from the bull’s mouth). Maariv, which has begun listing to the right in its old age, notes that there is “a weak majority in the government for the release of 104 prisoners,” and accompanies its headline with cutouts of letters on the plan from the prime minister and terror victims’ rights association Almagor, one of the most outspoken opponents of the deal. Staid ol’ Haaretz, with as much pizzazz as a Ben Stein imitation contest (Bueller…Bueller), reports dryly that “the government will vote today on the release of Palestinian prisoners,” providing a counterpoint to the sensationalist and centrist Yedioth Ahronoth, which uses all the subtlety of a televangelist on angel dust to announce the ”prisoner’s dilemma,” accompanied by stark black and red lettering and pictures of some of the worst of those behind bars, and their crimes. But the front page is just a big steaming bowl of pabulum compared to the meat and potatoes inside. All the papers sum up the news about the same, drawing the lines between who is for, who is against, who said what and the prediction that the measure will likely squeak through the cabinet. But they earn their paychecks with the analysis, commentary and ancillary coverage of the affair. Yedioth has a graphic of some two dozen of those on the release list and what they did, which reads like a laundry list of first intifada horrors. The paper’s Alex Fishman lines himself squarely in the opposed camp, asking where Netanyahu, so happy to set red lines on others, puts the limit on what he will do for the resumption of peace talks. “When Israel releases murderers because of pressure for a goodwill gesture, it gives up on its sovereignty. There is no precedent for this is any country in the world,” he writes. The paper also reports that despite a committee report on how to manage prisoner releases created in the wake of the Gilad Shalit swap, which saw over a thousand prisoners go free, the recommendations have yet to become official and Sunday’s cabinet vote, which will be voted on by ministers who know next to nothing about who is being released, flies in the face of the committee’s reported recommendations (which have never been released to the public). Maariv brings in the perspective of the families of the victims of said murderers, who, surprise, surprise, are none too happy about the deal. Israel Hayom, for some reason, runs a shortened repeat of its poll published Friday showing that most Israelis are against the prisoner release. In the paper’s corridors, the zeitgeist seems about the same, with peacenik Yossi Beilin, who is for the deal, getting about half the space of Nadav Shragai, who is against. According to Beilin, justice aside, the prisoners are no longer a threat to society, but can help pave the way toward a better future. In Haaretz, Barak Ravid writes that Netanyahu’s behavior ahead of the vote on the prisoners proves that he has only a tenuous grip on the country’s steering wheel. Palestinians in the clink may soon be tasting freedom, but one man who won’t be is Mohammed Morsi, who was officially jailed on Friday over Hamas contacts among other things. Yedioth reports that with the civil war in Syria, the ostracizing of Hezbollah and now the Egyptian coup, Hamas finds itself suddenly very much alone in the world of jihad. Haaretz reports that the situation is even worse than what Hamas is facing, with the downfall of the Muslim Brotherhood being repeated across the Arab world marking a low point for political Islamism. Just moments before they were to step into the cabinet meeting to vote on releasing security prisoners as part of the restart of peace talks with the Palestinians, Education Minister Shai Piron and Homefront Defense Minister Gilad Erdan announced that they planned to vote against the motion. Though the decision by Yesh Atid member Piron and prime minister loyalist Erdan came as a surprise, it will likely not be enough to turn the tide in the vote on approving the release of 104 Palestinian and Arab Israeli prisoners jailed since before the 1993 Oslo Accords. Prime Minister Benjamin Netanyahu postponed the commencement of the meeting in order to take time to convince his Likud party ministers to back up his proposal. Netanyahu invited Shin Bet head Yoram Cohen to brief the ministers on the security ramifications of approving the release, reiterating that any decision regarding the release of Arab-Israeli prisoners would be brought before the cabinet and that any “provocation” would lead to the halt of further releases. As the tally currently stands, Yesh Atid’s four other ministers and Hatnua’s two are planning to vote for the measure. In the Likud, Netanyahu will obviously vote in favor, as will those ministers who are politically dependent on Netanyahu for their positions, including Minister of Intelligence, International Relations and Strategic Affairs Yuval Steinitz and most likely also Culture and Sport Minister Limor Livnat. Interior Minister Gideon Sa’ar and Water and Energy Minister Silvan Shalom are thought to support the release, or at least to be willing to grudgingly vote in favor in order to permit Netanyahu to move ahead with the American-brokered peace talks. Significantly, two separate sources confirmed to The Times of Israel on Saturday night that Defense Minister Moshe Ya’alon is expected to vote in favor. Ya’alon has opposed prisoner releases in the past, and his security credentials — he is a former chief of staff of the IDF — may ease the worries of many ministers who are hesitating to vote with Netanyahu. 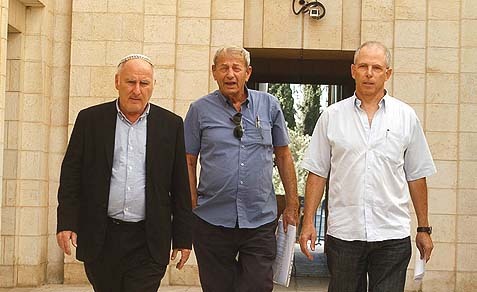 Yisrael Beytenu’s four ministers were granted the right to vote as they see fit by party leader Avigdor Liberman. While Internal Security Minister Yitzhak Aharonovitch is expected to vote in favor, it is likely that Agriculture Minister Yair Shamir and Tourism Minister Uzi Landau will vote against. While waiting for the meeting to begin, Bennett spoke to families of terror victims who were staging a demonstration against the decision outside the prime minister’s office. “Releasing murderers brings a lot of bereavement and it is a mark of disgrace against Israel. Anyone on the other side [the Palestinians] who today calls for the release of murderers and burners of children and women, does not deserve to be called a partner,’ said Bennet. Bennet told the families to keep their heads held high. “Terrorists need to be wiped out, not released. We will vote against releasing murderers,” he promised. Finance Minister Yair Lapid said ahead of the meeting that while he was saddened by the decision to release murderers, it was necessary in order to give peace a chance. A new appointment that Netanyahu hopes will prevent future cabinet squabbles was announced Sunday. Minister of Science and Technology Yaakov Peri will be joining the inner cabinet committee set up to select which prisoners will go free and oversee the implementation. Peri, a former Shin Bet head who belongs to the centrist Yesh Atid party, will join Netanyau, Ya’alon, Justice Minister Tzipi Livni and Aharonovitch on the committee. The addition of Peri is meant to ensure Netanyahu a majority in the event that Ya’alon and Aharonovitch were to decide to torpedo aspects of the deal. Netanyahu reportedly promised US Secretary of State John Kerry that the decision to release the 104 long-term prisoners would go through. On Friday, Palestinian Authority President Mahmoud Abbas told the Palestinian public that it could expect a “pleasant surprise” on Sunday. The prisoners are set to be freed in four phases over the next nine months, as Israeli-Palestinian peace talks, set to resume in Washington on Tuesday, progress. Bereaved families protested Prime Minister Binyamin Netanyahu’s intention to release 104 Palestinian prisoners as a gesture to the Palestinians ahead of the resumption of peace talks, Channel 2 reported. Dozens of protesters gathered outside the Prime Minister’s Office on Sunday morning, holding photos of loved ones killed by the prisoners intended for release, to call on the government not to approve the gesture. “The prime minister is encouraging terror by releasing terrorists and murderers,” Channel 2 quoted protesters as saying. “The message here is that murderers will eventually be released and that terrorism is worthwhile,” a spokesman for terror victims association Almagor said. The Almagor terror victims’ organization has sent Netanyahu a letter of protest over his decision to release 104 terrorists. The Almagor terror victims’ organization has sent Prime Minister Binyamin Netanyahu a letter, on behalf of families whose loved ones were murdered in terrorist attacks, in which it protests his decision to release 104 terrorists in advance of peace talks with the Palestinian Authority. In the letter, the families accuse Netanyahu of caving, once again, to demands from the international community in order to enter peace negotiations. “Netanyahu in his letter to the public tries to explain his capitulation to terrorism and his alarming willingness to release more murderers with blood on their hands. These are the most heinous killers,” wrote Almagor. “Again it seems that when a difficult moment came, the Prime Minister caved and did not withstand the pressure. It seems that the Nobel Peace Prize which is winking to Obama and Kerry overshadows any moral and reasonable consideration, and Israel is pressured again into failed negotiations, the disappointing results of which may bring about another circle of violence,” wrote the terror victims’ families. The families claimed in the letter that they were recently promised that terrorists will not be released for peace talks. Among other things, they note, MK Ofir Akunis (Likud) was sent to meet the families and reassure them that the issue is not on the agenda. “Akunis was sent to deceive the bereaved and hurt families in order to stop the struggle we started,” they said. The families noted that they repeatedly asked to meet Netanyahu or his staff ahead of Sunday’s vote on the release, but were refused time after time. The Almagor Terror Victims Association overnight Saturday condemned Prime Minister Binyamin Netanyahu after he released an open letter discussing his decision to release Palestinian prisoners as a gesture to the Palestinian Authority ahead of the renewal of peace talks slated for next week. In a letter issued to the Israeli public, Almagor expressed its opposition to the release of the “most heinous murderers” as contradictory to the premier’s discourse on preventing terrorism. “We will come to the cabinet meeting tomorrow to express our opposition and our opinion on this wanton release, and we will demand that negotiations without preconditions will truly be negotiations without preliminary acquiescence,” the association said among a number of listed greivances over the decision. Dozens gather at the Prime Minister’s Office to protest against plan to release Palestinian prisoners ahead of peace talks • Naftali Bennett: Anyone on the other side who demands the release of murderers is not worthy of being called a partner. Dozens of demonstrators gathered at Prime Minister Benjamin Netanyahu’s bureau on Sunday to protest the planned release of 104 Palestinian prisoners ahead of renewed peace talks set to begin this week. “The prime minister is encouraging terror by releasing terrorists and killers,” Channel 2 news quoted a demonstrator as saying Sunday as dozens carried pictures of loved ones killed in terror attacks. The demonstrators asked Bennett to work within the cabinet to prevent the prisoner release. “Don’t let them win,” Channel 2 quoted one bereaved mother as saying. “We call on you to bring the government down and withdraw from a coalition that would release murderers,” another demonstrator demanded. An Israel Hayom poll issued Friday revealed that 84.9% of Israelis oppose the release of Palestinian prisoners and that 61.6% are in favor of putting any future peace agreement with the Palestinians to a referendum. Meanwhile, a poll conducted on behalf of the Almagor bereaved families group suggested that 88% of Israel’s Jewish population opposes the release of Palestinian prisoners with “blood on their hands” — individuals who physically took part in committing murders — in order to jump-start peace talks. A Haaretz-Dialog poll issued Friday revealed that 69% of Israelis believe that the chance that a peace agreement will be achieved this time is very low. The same poll revealed that 58% would like any permanent future deal to be put to a referendum. Jerusalem (AFP)—Israeli Prime Minister Benjamin Netanyahu will seek cabinet approval on Sunday for a contentious release of 104 veteran Palestinian and Israeli-Arab prisoners, to coincide with the resumption of peace talks. While the names of the prisoners have yet to be officially published, or even revealed to ministers, they reportedly include militants convicted of killing Israeli women and children or Palestinians suspected of collaborating with Israel. An unofficial list published by Almagor, a group representing Israeli victims of Palestinian attacks, said that candidates for release also included those jailed for acts such as the killing of a creditor, murder during car theft and a man convicted of strangling his wife whom he suspected of adultery. The planned releases have brought protests from Israeli victims’ families and from Netanyahu’s hardline coalition partners. The premier said in an open letter published on his Facebook page that he too had deep misgivings. Israeli media reported on Sunday that the far-right Jewish Home party intends to vote against the plan, while the equally hardline Yisrael Beitenu had given its ministers a free vote. There were rumblings within Netanyahu’s own right-wing Likud party too, with deputy defence minister Danny Danon urging the party’s ministers to vote “no” in Sunday’s cabinet session, which begins at 0700 GMT. “I say that this is a diplomatic mistake, a moral mistake,’ he told public radio. Commentators nevertheless expected Netanyahu to win the vote, albeit by a narrow margin. A Palestinian official told AFP on Saturday that the US-brokered renewal of peace talks, stalled since September 2010, would open in Washington on Tuesday. Qadura Fares, head of the Palestinian Prisoners’ Club which tracks the well-being of Palestinians in Israeli jails, said on Sunday that there would be no talks unless all 104 prisoners returned to their homes. “If they don’t free all of them, there will be no negotiations,” he told public radio. In past deals, Israel has expelled some freed prisoners from the occupied West Bank or annexed east Jerusalem to the Gaza Strip or abroad but Fares said that would not be acceptable this time. The cabinet will hear a formal statement from Netanyahu on the resumption of peace talks and mandate a ministerial committee to handle the prisoner release, the government website said. Israeli news website Ynet said Netanyahu would head the prisoner committee deciding which prisoners are to be freed and when. The cabinet is also set to draw up a bill to submit any peace treaty with the Palestinians to a referendum. Such a vote would be a final endorsement of a treaty after ratification by the government and parliament. The draft is seen as a gesture to right-wing ministers apprehensive of concessions that could be demanded of Israel in the talks. A cabinet briefing paper said the government saw approval of the new draft as “urgent and important” and said it would be asking parliament to fast-track its passage into law. Prime Minister Netanyahu will aim for a final status deal, not an interim agreement • It is clear to everyone that any agreement will entail the evacuation of settlements. When Environmental Protection Minister Amir Peretz (Hatnuah) was a child, his mother, Rahma, would often head to the open-air market in Gaza to do some shopping. One summer day, instead of coming back home with a basket of groceries, Rahma returned to her house in Sderot with a truck full of painted floor tiles. Within a week, the entire house had been retiled. A few years later, after his mother had passed away, Peretz made a trip to his native Morocco, the country from which he made aliya when he was five years old. Upon arriving at his parents’ old home, he rang the doorbell and walked inside. To his amazement, he discovered that the tiling in the house was the exact same design as the samples that his mother brought home from Gaza. Will we ever go back to the open-air markets of Gaza? Or will that experience remain solely in the memory banks of the older generations? Peretz asked those questions this week, smiling whimsically at the thought. Yet although he is the most dovish member of the government, his eyes give him away as a man who has resigned himself to the fact that peace will not break out here. The most that can be hoped for is “an honorable divorce,” as Finance Minister Yair Lapid put it. Peretz wonders whether a Palestinian state that arises will encompass just Judea and Samaria. Or will it also include Hamastan in the Gaza Strip? Does the Israeli government have a view on this issue? This difficult question, which is obviously one of many that will be tackled during the discussions in Washington between Israel and the Palestinians, will have to be addressed by the leaders. Then it will be presented to the respective peoples in a referendum that would take place at the end of the process. Peretz believes that Prime Minister Benjamin Netanyahu has “evolved from a stage where he was interested in managing the conflict to one where he is interested in solving it.” A number of other senior ministers share this assessment, chief among them Science and Technology Minister Yaakov Peri of Yesh Atid. For his part, Netanyahu used the occasion of a special cabinet meeting at the Menachem Begin Heritage Center to persuade the public of the sincerity of his intentions. At the session, which marked the centennial anniversary of the birth of the legendary Likud leader and late prime minister, Netanyahu said that the challenge that motivated him was two-fold. First, he wanted to prevent the reality of a binational state from taking hold between the Jordan River and the Mediterranean Sea. Secondly, he wanted to prevent the establishment of an Iranian-backed terrorist state on that same swath of land. He spoke of the concessions that the Palestinians needed to make, while reminding everyone that to this day the party that has consistently refused peace has been the Palestinians. The central issue in these negotiations is the border. It is the issue which will serve as a litmus test indicating the readiness of Palestinian Authority President Mahmoud Abbas to make concessions. Israel’s position is clear: there will be no return to the ’67 lines; the settlement blocs will remain in Israeli hands, as will Jerusalem, along with demilitarized areas that are needed to ensure security. In previous negotiations with the Prime Ministers Ehud Barak and Ehud Olmert, Abbas already pocketed all of the territories along the 1967 lines, with territorial swaps equaling approximately two percent. Netanyahu’s starting point will be entirely different, hence there is an expectation that Abbas will compromise. It is clear to everyone that any agreement will entail the evacuation of settlements. The word pair “painful decisions” was employed this past week by U.S. Secretary of State John Kerry, the premier himself, and some of his ministers. The key question will be how many tens of thousands of residents will need to be evicted? And when will the evacuation take place? The negotiations are expected to begin this week in Washington. Justice Minister Tzipi Livni and the prime minister’s personal envoy, Yitzhak Molcho, will sit down with Palestinian negotiator Saeb Erekat. Each side will present its demands. Then the Americans will have to figure out how to address these demands so as to enable the negotiations to continue. Ultimately, when the gaps are made apparent, proposals will be made for compromises. One essential question where disagreement is inevitable and where neither side is willing to compromise is the future status of Jerusalem. When Abbas met with Kerry in Ramallah, a large picture of Al-Aqsa mosque hung against the wall behind them. Netanyahu is the one who coined the term “the rock of our existence” when discussing the Temple Mount. What happens when agreement can’t be reached on the issue of Jerusalem? Some assessments predict that both sides will opt for an interim agreement. If there is agreement on the borders, security arrangements, economic issues, movement of Palestinians, and other issues, but there is no agreement regarding Jerusalem or the refugees, then it will be possible to reach a partial deal. It makes little sense to focus solely on the Israeli side. Much will depend on the mediating abilities of the Americans. Can Kerry create the sense among all parties that they received more than what they could get? Could he have them believe that they won? “Netanyahu really does want peace, but he’s not willing to pay the price for peace,” Beilin said. On the other hand, there are those who argue that with Iran intensifying its involvement in Syria and Lebanon, this is not the time to create yet another unstable country in the region. Energy and Water Resources Minister Uzi Landau (Yisrael Beytenu) is convinced that any agreement should be years down the line. Landau’s boss, Yisrael Beytenu Chairman MK Avigdor Lieberman, as chairman of the Knesset Foreign Affairs and Defense Committee, has met with his counterpart in the European parliament, Elmar Brok. After Lieberman noted that Brok “is one of the good guys,” namely a friend of Israel, he felt free to unleash his thoughts. “The conduct of you, the Europeans, stems from a basic lack of understanding, perhaps even an anti-Israel obsession,” the former foreign minister said. “To think that it is possible to reach a permanent status agreement in light of everything that is happening in the region is akin to thinking that one could lay the foundations of a new building during an earthquake,” he said. It’s important to listen to what Lieberman is saying, because it is Lieberman who determines which way his ministers will vote. On Sunday, the government is expected to give its approval for the start of negotiations. It will also resolve that any diplomatic agreement is to be brought before a referendum. The government will also approve the formation of a special ministerial committee to rubber stamp the release of 85 terrorists who were jailed prior to the Oslo Accords. The release will take place after the UN General Assembly this coming September, and only after it becomes clear that Abbas will not seek recognition of a Palestinian state there. Netanyahu can satisfactorily boast to his ministers of a number of achievements attained in agreeing to return to negotiations. These are achievements that can be personally attributed to the premier in his dealings with the Americans, the Europeans, and the Quartet. Netanyahu is to be credited for standing firm and holding back the diplomatic onslaught that followed in the wake of the negotiations held by Olmert. Both sides have agreed that the negotiations would be lengthy. This way, Abbas will not be tempted to run away in the middle whilst pointing the finger at Israel. The Palestinians will not appeal to the UN nor will they take unilateral steps. In addition, there is no freeze on construction. What is also significant is that the Arab League has agreed to support the renewal of talks. All of this, however, comes with a price – the release of terrorist murderers. Almagor, an advocacy group for bereaved families, arranged a phone campaign by the relatives of terrorism victims to government ministers. They requested that the ministers meet with them to allow them to try to persuade them, with their own personal stories, to vote against the prisoners’ release. The bereaved families are taking their cue from Gilad Schalit’s parents and the manner in which they enlisted public opinion in their favor. None of the ministers thought it right to meet them. Just two of the ministers, Uzi Landau and Meir Cohen (Yesh Atid), encouraged them by vowing to vote nay. The other ministers said they “are familiar with the topic.” In conversations with ministers, all of them emphasize the fact that there is no strategic problem in releasing terrorists, but they would rather ignore any questions regarding the moral implications of their release. Another question that is keeping the ministers awake at night is whether the released terrorists will be banished to the Gaza Strip or permitted back to their homes in Judea and Samaria. Will the images of murderous terrorists whose release will be celebrated in the town squares of Ramallah with Abbas’ participation help or hurt the negotiations? In years past, when Abbas took part in such celebrations while praising murderers as freedom fighters, Netanyahu looked upon this as an attempt to derail talks. This time, will it just be a fit of turbulence? The majority of Israeli Jews are against releasing Palestinian prisoners with blood on their hands as a gesture to Palestinian Authority President Mahmoud Abbas ahead of the resumption of peace talks, according to a Smith Research poll conducted on Wednesday for terror victims organization Almagor. The poll of 500 Israelis representing a sample of the adult population found that 80 percent of secular Jews said they were against releasing these Palestinian prisoners, while over 95% of conservative and orthodox Jews objected to such a gesture. Palestinians have long demanded that Israel free prisoners held since before 1993, when the two sides signed the Oslo Accords – an interim deal intended to lead to an independent state the Palestinians seek in east Jerusalem, the West Bank and the Gaza Strip. International Relations Minister Yuval Steinitz said on Saturday that Israel has agreed to a long-standing Palestinian demand to release Palestinian prisoners in order to resume peace talks, but will not yield on other central issues. “There will be some release of prisoners,” Steinitz told Israel Radio. “I don’t want to give numbers but there will be heavyweight prisoners who have been in jail for dozens of years,” he said. The release would be carried out in phases, he added. Steinitz indicated that some of those who would be released had been convicted of violent crimes against Israelis. “It will not be simple, but we will make that gesture,” he said. On Monday, the head of the pardons department of the Justice Ministry, attorney Emi Palmor, said the US-sponsored plan to restart peace talks will include the release of 82 terrorists, all of whom have blood on their hands and are serving life sentences. The 82 prisoners in question are all Palestinians from the West Bank and Gaza who were sentenced for their crimes before the signing of the Oslo Accords in 1993. The poll’s overall sampling error is plus or minus 4.5%. Almagor, an organization founded in 1986 in the wake of the Jibril Deal, advocates for terror victims’ rights. Palestinian terrorist Samir Kuntar who was released previously by the Israeli government. Photo: Wikimedia Commons. A poll of 500 adult Israelis showed that 80 percent of secular Jews in Israel are against releasing Palestinian terrorists incarcerated in Israeli jails for their crimes as a gesture toward the renewing of Israeli-Palestinian conflict negotiations. Among more religious Jews, more than 95 percent are against such a move. The Smith Research poll was conducted Wednesday for the terror victims organization Almagor. U.S. Secretary of State John Kerry’s announced last week that Israelis and Palestinians have reached a new “basis” for peace negotiations, and Israel was asked to release 85 Palestinian terrorists imprisoned before the 1993 Oslo Accords in order to start the negotiations. On Saturday, Israeli International Relations Minister Yuval Steinitz said the prisoner released will include “heavyweight prisoners who have been in jail for dozens of years” and have been convicted of violent crimes against Israelis, the Jerusalem Post reported. “It will not be simple, but we will make that gesture,” Steinitz said. PM speaks at National Defense College graduation, says peace is made only between the strong • Netanyahu and President Shimon Peres both meet with visiting Japanese Foreign Minister Fumio Kishida • Peres: I don’t fear a national referendum on peace deal. “Peace is only made between the strong,” Netanyahu said. Earlier on Wednesday, Netanyahu met with Japanese Foreign Minister Fumio Kishida. Netanyahu recognized that both countries face threats from rogue nations with nuclear weapons programs: Iran and North Korea. The Iranian nuclear issue was also discussed at a meeting in London on Wednesday between Strategic Affairs Minister Dr. Yuval Steinitz and British Foreign Secretary William Hague. Kishida also met with President Shimon Peres in Jerusalem on Wednesday. Peres expressed appreciation for Japan’s role in efforts to prevent Iran from obtaining nuclear weapons. Peres said that Japan, which has suffered the most from nuclear weapons, understands the danger a nuclear Iran would pose. Peres said he hoped economic sanctions would succeed in thwarting Iran’s nuclear ambitions. Also on Wednesday, Peres told the U.S.-based Arabic-language Alhurra media outlet that he did not fear a national referendum on a peace deal reached with the Palestinians, as he believes a majority of Israelis want peace. With the renewal of talks with the Palestinians, bereaved families are planning to launch a campaign against the release of convicted Palestinian terrorists from Israeli jails. Demonstrators are planning to picket outside the cabinet meeting on Sunday. The Almagor Terror Victims Association, activists from the My Israel, Im Tirzu, and Young Likud groups and rightist MKs will take part in the protest. Also, an Almagor representative planned to try to present Netanyahu on Thursday with a letter seeking a meeting. Bereaved families say cabinet’s plan to release 85 Palestinian prisoners considered “heavyweight terrorists” as part of resuming the peace talks with the PA is “a disgrace to the Israeli justice system” • Families demand a meeting with cabinet before vote. The 85 prisoners in question are all considered “heavyweight terrorists” directly involved in murderous terror attacks against Israelis. “The possible release of these terrorists is a disgrace to the Israeli justice system,” said Ehud Bromberg, who lost his brother Avraham in a terror attack. Sgt. Avraham Bromberg, 20, who served in the Israel Defense Forces Armored Corps, was on his way home from his Golan Heights base when he was attacked by a group of terrorists on Nov. 26, 1980. Bromberg fought his assailants, but suffered a fatal head injury. He died at Rambam Hospital in Haifa four days after the attack. Bromberg’s murderers, Karim Younis and his cousin Maher Younis, were sentence to life imprisonment, but their sentence was commuted by President Shimon Peres in August 2012, making them eligible for parole in 2023. The Palestinians demand that the two be included in the upcoming prisoners release. Avraham’s son, Avi, who serves as spokesman of the Almagor Terror Victims Association, was livid Tuesday, when media reports confirmed that the cabinet will vote on the matter in the coming days. He is demanding that the cabinet’s vote be postponed pending a meeting between the representatives of the bereaved families and the ministers. Almagor Director Lt. Col. (ret.) Meir Indor also leveled harsh criticism at the government over the decision. Indor bashed the justice system’s treatment of its heavyweight prisoners, saying it weakened efforts to bring terrorists to justice. Rachel Weiss and her three small children were on their way to a family affair in Tiberias on October 30, 1988. As the bus the family was riding passed the northern outskirts of Jericho, it was ambushed and set ablaze with three Molotov cocktails. Rachel (26) and her three boys Netanel (3), Rephael (2) and Efraim (9 months) were killed in the attack, as was IDF soldier David Delarosa who attempted to rescue the family. Jomaa Adam, the terrorist who perpetrated the attack, is reportedly among the 82 Palestinian prisoners jailed by Israel before the signing of 1993 Oslo Peace Accords who will released if newly announced peace talks make headway. The Israeli cabinet will vote on the prisoner release as early as next Sunday, Israeli media reported, ahead of a scheduled first round of talks between Israeli Justice Minister Tzipi Livni and chief Palestinian negotiator Saeb Erekat in Washington. Israel has reportedly refused to release an additional 21 pre-Oslo prisoners, either because they are Israeli citizens or for other security reasons. Israeli officials have indicated the prisoners will be freed in phases, beginning 4-6 weeks into the negotiations, and continue doing at 6-8 week intervals depending on the progress of talks. Under Israeli law, the prisoners’ names will be published 48 hours before their release to allow families of their victims to appeal the decision with the Supreme Court. Adam is by no means the only still-jailed pre-Oslo terrorist whose attack is etched in Israeli collective memory. Khaled Al-Azraq laid a bomb in Jerusalem’s Mahaneh Yehuda market in May 1990, killing one man and injuring nine. He tried to do the same in Tel Aviv’s Carmel market. Mahmoud Muammar and Ibrahim Salah stabbed to death Hebrew University Professor Menachem Stern on his daily walk to the National Library in June 1989. “This issue kills us, but we’re a quiet family that doesn’t like to make noise,” he added, requesting that his name not be published. An exhaustive list of prisoners published by Almagor, an Israeli organization representing the families of terror victims, details attacks against hiking couples, Jewish employers, suspected Palestinian collaborators and against IDF soldiers; some involving kidnapping with the intent of prisoner exchange, others involving the mutilation of the victims’ bodies. For Palestinians, the prisoner issue could hardly be higher on the agenda. Prisoners are regularly glorified in public ceremonies and on Palestinian television; a Palestinian ministry pays their families monthly stipends; and demonstrations calling for their release take place periodically throughout the West Bank. Out of roughly 5,000 Palestinians currently imprisoned in Israeli jails, nearly half are serving time for violent acts against Israelis. Five hundred and fifty are serving life sentences, Israel’s Prison Service told journalists in April. Many Palestinians identify with the prisoners from personal experience. Former Palestinian prime minister Salam Fayyad announced last December that 800,000 Palestinians, encompassing 40% of its males, have been arrested at least once since Israel took control of the West Bank in 1967, applying martial law to its Palestinian residents. Kadoura Fares, a Fatah official and head of the Palestinian Prisoner’s Club, a nongovernmental organization, told The Times of Israel in April that the release of pre-Oslo prisoners would be a condition the Palestinian leadership could hardly forego. He added that Palestinian society generally makes no distinction between prisoners who killed Israeli civilians and those who killed soldiers. By keeping negotiations discreet, the prime minister enables Bayit Yehudi to stay in the coalition for an extended period of time, even as Israel’s chief negotiator Livni makes serious concessions on Netanyahu’s behalf. Netanyahu kept Bayit Yehudi leader Naftali Bennett satisfied by receiving a commitment from the Americans that they would not say the talks would be based on pre-1967 borders. That enabled Bennett to claim victory, despite Netanyahu agreeing to release dozens of terrorists from prison. Receiving a commitment that the talks will be held discretely could keep Bayit Yehudi in the coalition for an extended period of time, even as Israel’s chief negotiator, Justice Minister Tzipi Livni, makes serious concessions at Netanyahu’s behest. “As long as we are not giving up our territorial assets, we are staying in the coalition,” said Bayit Yehudi faction head Ayelet Shaked. Science, Technology, and Space Minister Ya’acov Peri (Yesh Atid), who is the cabinet’s most dovish minister, hinted that if Bayit Yehudi left the government, Labor could come instead. “If God forbid there be a crisis in the coalition, there is a majority for the peace process in the Knesset and there will be a government that can continue it,” Peri said. But Labor leader Shelly Yacimovich said her party would only join if a peace agreement had been reached with the Palestinians and the Right leaves the government in protest. “We would not want to be the reason peace is not reached,” Yacimovich said. At a meeting with President Shimon Peres, Yacimovich pledged to defend Netanyahu from the extreme Right in the Likud and the coalition. She stressed that it was important to remember that the goal is not the process itself but reaching an agreement. Transportation Minister Yisrael Katz (Likud Beytenu) questioned the ability of Palestinian Authority chairman Mahmoud Abbas to lead negotiations toward a peace agreement with Israel, saying that he had less control over Palestinians than Syrian dictator Bashar Assad has control over Syria at the moment. “Just as nobody would seriously consider giving Assad land in his current situation, it is impossible to seriously think about transferring the control of territories to the Palestinians,” Katz said prior to entering the weekly cabinet meeting. The terror victims association Almagor intends to protest against releasing murderers in several ways. It co-sponsored an Internet ad campaign with Arabs praising Netanyahu. Families of terror victims intend to come to a special meeting of the Knesset Interior Committee on Monday. Later in the week, they will pitch a tent outside Netanyahu’s official residence in Jerusalem, near where the Schalit family protested for the freedom of their kidnapped soldier son Gilad. The protest tent will be called “A Place Under the Sun,” the name of a book Netanyahu authored, in which he criticized past releases of terrorists. Israel agrees to release 85 Palestinian prisoners considered “heavyweight terrorists,” who were imprisoned prior to 1993 Oslo accords • Government plans on pursuing gradual prisoner release, according to the progress achieved in the peace talks. Israel has agreed to release 85 Palestinian terrorists who were convicted and imprisoned prior to the 1993 Oslo Accords. The government plans to release the prisoners gradually, with the first phase set to take place in four to six weeks. The Palestinian Authority demanded the immediate release of all 85 prisoners as a precondition for resuming peace talks with Israel, but the request was denied. The terrorists in question were convicted of multiple counts of murder and sentenced to more than one life sentence. All of them have so far served between 20 and 28 years of their sentences. Some 119 prisoners are currently serving out sentences in Israeli jails for cases predating the Oslo Accords. Fifteen of them were convicted of criminal offenses and 19 are Israeli Arab. Neither group is expected to be released as part of the PA deal. As in previous cases, the list of prisoners slated to be released will be made public only shortly before the deal takes place, to allow various individuals and groups to petition the High Court of Justice over specific cases. Palestinian Authority President Mahmoud Abbas has reportedly made several specific requests, asking for the release of Hamas operatives Mahmoud Isa and Majed Abu Kteish, who were convicted of the abduction and murder of Border policeman Sgt. Maj. Nissim Toledano in 1992; Jamil Hassan Mahmoud Abu Srour and Hassan Abd Hamid Nasser Abu Srour from Beit Jala, who together murdered Shin Bet agent Hayim Nahmani in 1993, one month after Israel deported hundreds of Hamas operatives to Lebanon; and Daoud Adal Hassan Mahmad, who was convicted of the 1987 murder of Ofra Moses and her son, Tal, in a Molotov cocktail attack on their car near the Alfei Menashe settlement in western Samaria. Louis Rene Beres is a professor of political science and international law at Purdue University. What sort of people and government would agree to free the murderers of its own children and do it in the name of a presumed “good will” toward irreconcilable enemies? What might this people and government be thinking, especially when its hoped-for quid pro quo is an obvious delusion? Inconceivably, in Jerusalem, there is evidence that Prime Minister Benjamin Netanyahu may soon oblige Washington and go along with at least a partial release of Palestinians serving time for perpetrating unspeakable violence against Israelis. Leaving aside that any such release would be unreciprocated, and that both the Palestinian Authority and Hamas would remain committed to Israel’s eradication, this contemplated freeing of terrorists would also be inherently illegal. All countries coexist under a binding law of nations. A core element of this international law is the rule of nullum crimen sine poena, or “no crime without a punishment.” An unchanging principle, drawn from the law of ancient Israel, it was reaffirmed for all nations at the historic Nuremberg Trials (1945-46). Should President Obama concur in any terrorist release, effectively an act of American complicity with international criminal activity, the United States would be in violation not only of international law, but its own laws. International law is already part of U.S. law by virtue of Article 6 of the U.S. Constitution, and also by a number of landmark Supreme Court decisions, especially the Paquete Habana (1900). In June 2003, the Israel Law Center, in anticipation of then-planned terrorist releases, had condemned Israel’s intended freeing of 100 Palestinian prisoners. Later, almost five times that number were actually set loose by Prime Minister Ariel Sharon. The dire results were exactly as Law Center Director Nitsana Darshan-Leitner had warned, including grotesque suicide-bomb attacks by several of the newly-released Fatah terrorists. Every state has an obligation under international law to apprehend and punish terrorists. This derives in part from the vital expectation of “no crime without a punishment.” It is codified widely and is also deducible from the authoritative Nuremberg Principles (1950). International law presumes solidarity between states in the fight against all crime, including terrorism. Although Israel has unequivocal jurisdiction to punish crimes committed on its own territory, it may sometimes also have the right to act under certain broader principles of “universal jurisdiction.” Its particular case for such wider jurisdiction would be found at the four Geneva Conventions of Aug. 12, 1949. No government on earth has the legal right to free terrorists as a “goodwill gesture.” Not the government of Israel; not the government of the United States. Terrorism is a criminally sanctionable violation of international law, one that is never subject to any unwittingly capricious manipulations by individual countries. In the United States, the president’s power to pardon purposefully excludes any violations of international law. In its original capture and punishment of Arab terrorists, Israel had acted on behalf of all nations. Because some of these terrorists had also committed crimes directed against other states, Israel cannot now permissibly pardon these offenses without regard to other sovereign states. Although Mr. Netanyahu’s anticipated terrorist release would not, strictly speaking, represent a “pardon,” it would have the same juridical effect. No state possesses any sort of authority to pardon violations of international law, especially the uniquely cruel violations generated by Palestinian terrorism. No matter what might be permissible under its own Basic Law, any political freeing of terrorists by Israel would always be legally indefensible. A fundamental principle is established in law that by virtue of any such releases, the releasing state itself must assume responsibility for pertinent past criminal acts and for future ones. Under international law, Mr. Netanyahu’s contemplated release of Palestinian terrorists, effectively analogous to a mass pardoning of international criminals, would implicate the Jewish state in a “denial of justice.” This irremediable implication could have profound practical consequences. Although it is arguable that punishment, which is always central to justice, does not always deter future crimes, any such Israeli freeing of terrorists would still undermine the Jewish state’s binding legal obligation to incapacitate violent criminals from committing any new acts of mass murder. Economy minister: Freeing prisoners not a gesture but a disgrace. The government must not release Palestinian prisoners as a gesture to open peace talks, Economy Minister Naftali Bennett said Sunday, as Almagor Terror Victims sent messages to ministers in the same vein. The Bayit Yehudi leader emphasized that the prisoners are people who murdered Israelis and other Jews, including children. “I don’t believe that Netanyahu will release murderers just so he can start negotiations,” Bennett added. Also Sunday, ministers received a strange phone call, ostensibly from Palestinian Prisoners Minister Issa Karaka. The pre-recorded phone call, sent by Almagor Terror Victims, featured an actor impersonating Karaka. Almagor launched a campaign in recent weeks to prevent the government from releasing Palestinian prisoners as a gesture in peace talks, following reports that US Secretary of State John Kerry’s peace plan demands that Israel release over 100 Palestinian prisoners arrested before the Oslo Accords were signed. The organization’s director Lt.-Col. (res.) Meir Indor has visited several ministers and political parties, as well as Knesset Speaker Yuli Edelstein, presenting them with a list of the 120 terrorists Palestinian Authority President Mahmoud Abbas requested be released, and who each of those terrorists killed. The list comes in a booklet entitled “Have we gone crazy?” featuring photos of the terrorists and their victims. Almagor and My Israel have launched a massive PR campaign in order to thwart the possibility of terrorist release in advance of PA negotiations. As part of the activity, a staged recording of the ‘PA Minister for Prisoner’s Affairs’ was called in to the government, featuring a humorous expression of gratitude over the gesture. The organizations say the government should not cater to PA whims in order to persuade them to agree to negotiate. Parents of children murdered by terrorists on Abbas’ release list lobby Edelstein to stop “horrible actions” by Netanyahu. It would be immoral and illegal for the government to release terrorists from prison as a gesture to open peace talks, the Almagor Terror Victims told Knesset Speaker Yuli Edelstein. “Recent reports quoting ‘diplomatic sources’ that say [Prime Minister Binyamin Netanyahu] won’t agree to the price of 120 murderers and will not allow them to be a precondition for starting talks raised suspicions that something serious was afoot. Now, we hear that some of the terrorists out of the 120 will be released,” Almagor director Lt.-Col. (res.) Meir Indor explained on Thursday. Indor presented Edelstein with a list of the 120 terrorists PA President Mahmoud Abbas requested be released and who each of those terrorists killed. Indor brought with him Geula Delarosa and Eliyahu Kremni, whose children were killed by terrorists on the list. The group visited Shas and Bayit Yehudi. Dr. Aryeh Bachrach, head of the bereaved parents’ forum in Almagor, said the organization has had bad experiences with Netanyahu making public statements about prisoners. “His statements are a cosmetic covering for horrible actions. 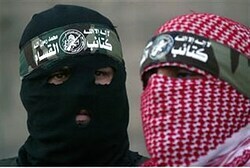 Whether he frees prisoners to jump-start peace talks or as a gesture for Ramadan, it’s the same thing,” Bachrach stated. One of the terrorists on the list is Hassan Atiq Sharif Abu Dahlia, who in 1991 stabbed to death his employer, Avi Osher, who owned a date farm in the Jordan Valley. Osher was survived by a wife and two children. Two more terrorists on the list, Salam Saliman Mahmoud Abu Harish and Adam Ibrahim Jumaa Jumaa attacked a bus with Molotov cocktails in 1988. The bus caught fire, and all of the passengers escaped, except for Rachel Weiss and her three children, Ephraim, Raphael and Netanel. IDF soldier David Delarosa returned to the burning vehicle in an attempt to save them. He did not succeed, and died of his injuries days later. Hassan Muhammad Agrabiya, Hassan Mahmoud Ibrahim Agrabiya, Mustafa Mahmad Yahya Agrabiya and Muhammad Tawafiq Saliman Yousef Jabarin, also on the list, infiltrated an IDF training area, killing Yaakov Dubinsky, 29, Guy Friedman, 20, and Yuri Ferda, 33, who was survived by his pregnant wife. The attack came to be known as “Night of the Pitchforks,” after the weapons the terrorists used. Two more terrorists on the list, Othman Amar Mustafa al-Haj and Ibrahim Mustafa Bilal Damara, killed Steven Fredrick Rosenfeld, a former US Marine who made aliya. Haj and Damara engaged Rosenfeld in conversation while he was on a hike near Ariel, where he lived. They grabbed a knife peeking out of his backpack and murdered him with it. We have yet to finish licking the wounds of the Shalit deal, and a new insane deal is being hatched. Some 120 terrorist blood-spillers are preparing to pack their bags. According to a list leaked to the Almagor Terror Victims Association, the terrorists slated for release in order to resume peace negotiations with the Palestinians were responsible for the murderous acts that shook Israel in the pre-Oslo days. Most of us remember the names of the victims to this day: Rachel Weiss and her children; soldier David Delarosa; Ofra and Tal Moses of Alfei Menashe; Nissim Toledano; Professor Menachem Stern and many more. True, many years have past, but as far as we know none of the victims have come back to life. On the bench behind me at synagogue sits Noam Ben-Zvi Klein, the son of one of the victims, and he continues to say Kaddish each year. A female terrorist who took part in the murder was released during the first Netanyahu government, and now Netanyahu is about to release the terror cell’s head gunman. Even if the terrorist won’t go back to his killing ways, his release will surely encourage more murders. The new generation of terrorists in Judea and Samaria will have further proof that murdering a Jew pays off: You sit in jail for a few years, earn an academic degree and go home. The State of Israel lacks the mental strength to make these murderers pay the appropriate price for their actions. It is only a matter of time, or a deal or a gesture, before they return to their families in good health. Israel 2011 released 1,000 dangerous enemies in exchange for one IDF soldier, and Israel 2013 is preparing to release 120 enemies for the right to talk to Mahmoud Abbas. Such a phenomenon does not exist anywhere else in the world. John Kerry, who is pressuring Netanyahu to release terrorists, represents a country that is not willing to deduct one day from the sentence of the security prisoners it is holding. The Jonathan Pollard case is just one example. The Jewish spy was imprisoned even before Rachel Weiss and her children were burned to death in Jericho, and the Palestinian murderer will most likely go home before he does. Even within the delusional Left you’d be hard pressed to identify a strong belief that any kind of peace can come from this scandal. Terrorism has become a military tool of states, not just sub-national organizations. Brig.-Gen. (ret.) Amatzya “Patzi” Hen and former ISA chief Meir Dagan once stood together at the forefront of the war on terror. Today they stand worlds apart on the question of the two-state paradigm. The difference between them is the difference between a man who, over the course of many years inside the system, became the captive of an illusion and a man who permits himself to think independently in terms of ideals and long-term strategy. Hen is a fierce fighter, a military man who commanded heroic battles over the Suez Canal during the Yom Kippur War. His makeshift regiment consisted of Shaked commandos who had run away from courses or interim unit assignments to the man who had commanded them during their time in Shaked. One of them was Dagan. Also there were Rimon commando Col. Shmulik Paz and former Knesset Member Capt. Yaakov “Ketzaleh” Katz, who was seriously wounded there. Nowadays Patzi lectures at IDF command colleges, where he analyzes past battles and the mistakes that were made during them. Patzi specializes in investigative inquiries; it has long been his contention that the IDF does not know how to perform these—unlike the Arab armies. And he is not alone: Uri Milstein has by now created a whole genre around this approach. Patzi applies his argument fully to Israel’s experience with terrorism and the Oslo Accords governing military relations with the PLO and the PA. Even though the accords came crashing down with the terrorist attacks of 1996 and collapsed even further in the 2000 terror war, Israel has failed to learn that agreements are no substitute for control in the field. As the former commander of the Shaked unit in Gaza, which played a central role in crushing the terrorism emanating from there in the seventies, Patzi has plenty to say on the topic. He opines that terrorism has become a military tool of states, not just sub-national organizations. Iran is one of the practitioners, but it is not alone. It is joined by the students of “Mother Russia,” which pioneered the technique before it spread to the rest of the world, perfecting the approach through the creation of colleges of terrorism and revolution. Patzi is a staunch opponent of the “two states for two peoples” formula, and considers upgrading the autonomous PA to a state a dangerous idea. Autonomy is dangerous enough. The proof is that we’ve lost more people to terrorism since the creation of the PA than before then: 1,400 dead Israelis. What would be if it gained sovereignty? More of the same. Terrorism has long been a substitute for conventional warfare, but the laws of war remain unchanged and unadapted to terrorism. Enemy states know very well how to take advantage of the obsolete laws of war as a legally sheltered tool for striking at Israel. Patzi also points out the under-appreciated ramifications of other developments: the Russian aliya, which counterbalanced the demographic threat; the revolution that is storming through the Arab world, which on one hand requires us to be strong and continue to realize the Zionist dream, and on the other to refrain from political processes involving parties that may and may not be around a decade from now. The way he sees it, it is not possible to fit a state in the narrow stretch of mountains that is Judea and Samaria. “There isn’t space for two states west of the Jordan,” he says. “The area is too small to contain both Israeli and Palestinian forces.” This is a military assessment, not an ideological one. What would keep Palestinian cells carrying officially issued weaponry from opening fire at Israeli forces, as already has happened at points along the seam, including Palestinians firing at Israelis while on joint patrol? Any agreements on military cooperation between the two sides would collapse when subjected to pressure, just as happened in the 2000 terror war. “Because there are no inquiries,” says Patzi, “they keep repeating the same mistakes. They’re even liable to make matters even worse by creating a Palestinian state.” The pursuit of terrorists across the border into a neighboring state would result in a Security Council session: this is what used to happen before the Six-Day War. Forget about any extended operations in a Palestinian state. Any action would take place under heavy time contraints, at high risk, and with a high probability of complications. Meir Dagan commanded the Rimon commando unit and headed the ISA. He also understands terrorism. But he thinks differently. “In the end there will be a Palestinian state,” he said to me in a private conversation in which I had tried to interest him in activity against the creation of such a thing. I asked Dagan, a former commander of mine, how we could deal with terrorism once a Palestinian state came into being. “Today there are enough sophisticated ways, including from the air,” Dagan said dryly, having chased down a few terrorists in his life. But that is a solution out of the ISA. It works for taking out a few terrorists. It is not adequate for bringing down a whole battalion of them. So how is it that two commanders, two friends, take two such diametrically opposed positions? Dagan doesn’t think a Palestinian state would be God’s gift to the world, but he spent many years inside the system. He is a captive of standardized schemes for finding solutions within the box, and speaks the language of low-intensity conflict doctrine, with its temporary, tactical solutions. For him, a Palestinian state is something unavoidable with which we will have to learn to live, come what may. Patzi, meanwhile, has been outside the system for many years. He sees matters in terms of military strategy: he thinks outside the box. That is what makes a man with political and military vision. Originally published in Makor Rishon. Chairwoman Ayelet Shaked of the Habayit Hayehudi (Jewish Home-New National Religious Party) Knesset faction and Jewish Home Member of Knesset Orit Struk will host Chairman Meir Indoor of the Almagor umbrella group of terror-victim organizations during the faction’s Monday-afternoon meeting before the meeting of the Knesset plenum. The meeting was prompted by reports that the Palestinian Authority is demanding the release of security prisoners as a condition to the resumption of peace talks with Israel. There have also been talks of a prisoner release as a goodwill gesture ahead of the Muslim holy month of Ramadan. Following the meeting, there will be an effort to get the signatures of Knesset members on legislation to prevent the wholesale release of terrorists.